The RG® Series are low resistance, valve regulated lead acid (VRLA) batteries. 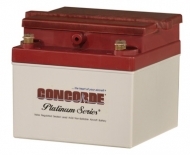 Recombinant Gas – The RG® Series are low resistance, valve regulated lead acid (VRLA) batteries. NOTE: The STC for some aircraft is available at an additional cost please contact info@aeroshop.gr if applicable to your aircraft.